SYDNEY, September 25, 2013 (AFP) – Australian road safety researchers on Wednesday unveiled a pioneering “attention-powered car” which uses a headset to monitor brain activity and slow acceleration during periods of distraction. The car, commissioned by the Royal Automobile Club of Western Australia, is about to depart on an awareness-raising road trip of Western Australia — a sprawling west coast state accounting for about one-third of the Australian continent. 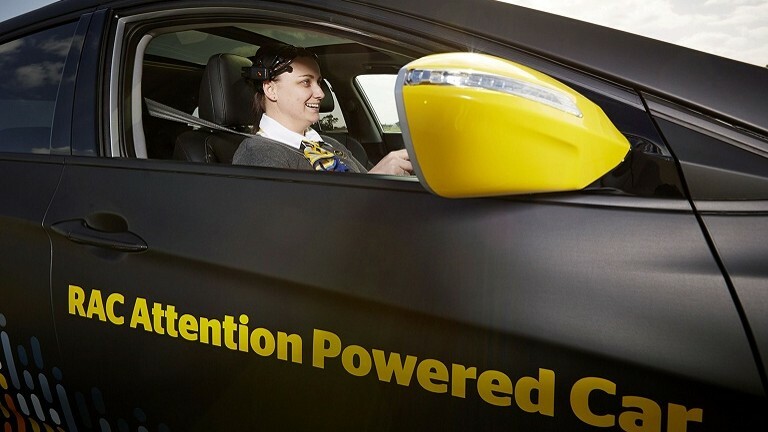 Lead researcher Geoffrey Mackellar, from neuroengineering company Emotiv, said the car’s accelerator could be overridden by a headset with 14 sensors measuring the type and amount of brain activity which determined whether a driver was distracted. In the testing phase, drivers were set specific challenges such as using their mobile phone, switching channels on the radio, drinking water or reading a map so that researchers could record their brain activity while doing so. They were also sent on a 15 kilometrs per hour “boredom lap” to see what happened when their brains “zoned out” — “pretty nasty but we enjoyed it,” Mackellar said. Emad Tahtouh, from production company FINCH, said the car used an array of neural inputs and specially-designed software to “go when you’re paying attention and slow when you’re not”. “We’re looking at things like blink rate, blink duration, gaze rate — how long they look at a point — eyes moving, head tilts, and also frequency of task-switching and the level of brain activity when they flick over to those tasks, so it’s a huge pool of data,” he said. The car worked by reducing acceleration when it detected a loss of attention, and speeding back up once full focus was back on driving. The pilot vehicle, a customized Hyundai i40, was built for the RAC as part of a research and publicity campaign to reduce the number of road deaths in the state, which currently run above the national average and are the worst in Australia. Although the system could have potential commercial applications, the RAC said their current focus was on research and public awareness. “The impact of inattention is now comparable to the number of deaths and serious injuries caused by speed and drink driving,” said RAC chief Pat Walker. The Australian government estimates that road accidents cost the economy Aus$ 27 billion (US$ 25 billion) every year.